New to Bingo? Donâ€™t worry, our wonderful team of Game Masters have put together this guide to help you get started in how to play bingo. Bingo is not a difficult game to play â€“ and with practice you can daub away your numbers with the best of them! Online it can even all be done for you with the help of the mighty auto-dauber! Hereâ€™s a mini guide to getting started with playing bingo online and showcase all the fantastic features our bingo games have to offer. From the games lobby, you can access different games from bingo to Vegas style table games. 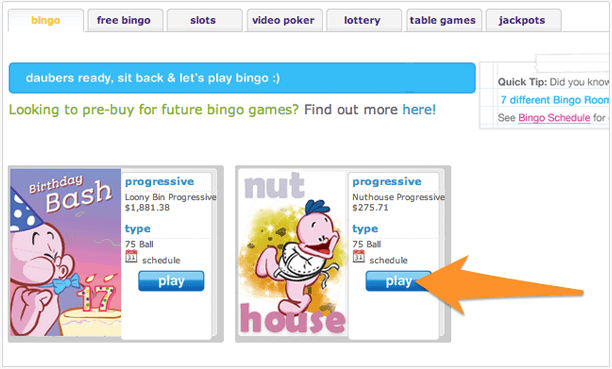 Click on the game tab of your choice to see a list of available games and bingo rooms. To enter a bingo room, simply click on â€œPlayâ€� the blue button. At different times of the day, different number of rooms available. Be sure to check out the bingo schedule page for available rooms and opening hours. Click on the card or cards of your choice. Then click â€œBuyâ€� button to confirm. It is possible that when you enter a room, the game will be in progress. A typical bingo game can last between 1 minute and 5 minutes, depending on the pattern. Thatâ€™s the bingo board which displays the number calls. The game prize and pattern are displayed here. To deposit funds into your account, visit the cashier page. By default, auto-daub is on so you can have your cards automatically daubed while you chat and play in multiple bingo rooms. You can toggle Auto Daub along with other settings through the â€œGame Optionsâ€� menu. The object of 75 Ball Bingo games is to match all the numbers in a special pattern on one of your Bingo cards. Random numbers are called out one at a time and shown on the callboard. If you complete the pattern youâ€™ve got BINGO and will win a prize! To add to the excitement of Bingo, youâ€™ll also have a chance to win Progressive Jackpots! callboard. After the winner is called for completing 1 line, everyone is in the running to complete 2 lines, and then full house. Each line completed awards a prize to one or more winners. When you have bingo, simply click on the CLAIM button directly below the callboard and bask in the excitement! Clicking on Bingo when you do NOT have a valid Bingo will result in an unpleasant and unfortunate sound that results from miscalling a bingo! Also note, if you fail to call Bingo when you are the valid winner will NOT disqualify you from being the winner! You will be declared the valid winner even if you have inadvertently closed your Bingo session or have been disconnected from the game. A progressive jackpot is a BIG cash prize, that all players have a chance of winning in a Bingo game. Every day the jackpots grow bigger and bigger until a lucky winner claims the big pot and a new jackpot begins. Each 75 Ball Bingo room has its own progressive jackpot, which is displayed just below the pattern board at the top of the Bingo screen. You win the jackpot if you match the pattern being played within a certain number of calls. You can see the maximum number of calls for the jackpot below the pattern board. Each 90 Ball Bingo room has its own progressive jackpot, which is displayed just below the line board at the top of the Bingo screen. You win the jackpot if you complete all 3 lines on one of your Bingo tickets in 40 calls or less. At Bingomania we have 3 rooms for you to play in â€“ each with their own distinct chat games and friendly GMâ€™s. Chat games are organized by our wonderful GMâ€™s and played in each of our Bingo rooms. Theyâ€™re fun little games that go on while playing Bingo. Bonus Bucks are awarded as prizes for winning chat games. They range from quite simple games of Nabors â€“ where the winnersâ€™ Nabors win BBs just for being to the right or left of the winner in the chat room, to number games wher you get to pick your lucky number that you think will be called and meet the chat game criteria. For a full list of our chat games and rules on how to play, click here. Bingo Bets apply to the last 6 numbers called in the game, before the final winning number gets called. This set of 6 final numbers is called the BingoBets Draw. BingoBets draw numbers continue to be drawn as bingo numbers are called. They get updated as each call is made. Please note that if bingo is called before the seventh number is called, then BingoBets are not applied to that game. You will be notified that your bet will be placed on the next available bingo game. You can play Bingo Bets regardless of whether youâ€™re playing Bingo or not. You can bet as often as you like, up to a maximum of 20 bets per game. There are 5 types of BingoBets. You can place more than one bet for each of the 5 but you cannot make the same bet more than once in a single game. For example, you can bet that the last number of the BingoBets draw will be higher than the first (in Bingo War). You can make another bet, in that game, that the last number of the BingoBets draw will be lower than the first. At this point, you cannot place a third bet that says the last number will be lower than the first, for that game. You can make the same bet on more than one game. In fact, you can make the same bet for up to 20 games. When you place your bet, simply choose the number of games this bet applies to. 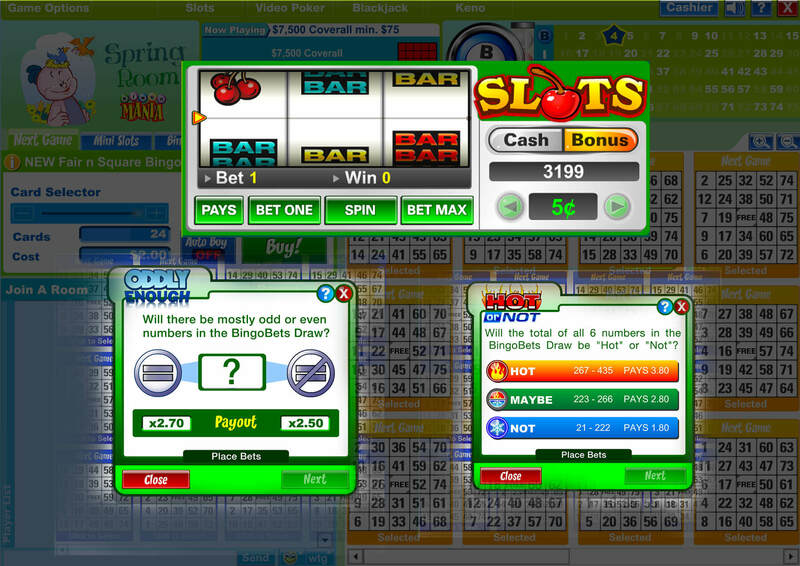 You bet is placed on that number of consecutive Bingo games that have the BingoBets option. 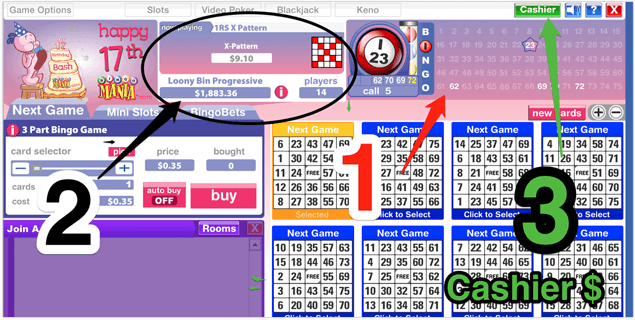 If you place a bet on a game where BingoBets is not being played, you will see a message that tells you that your bet is being held for the next available BingoBets game. Your bet will be listed under the Placed Next heading (on the Details tab). The money you wager on each bet is not taken from your account until the bingo game begins. If you run out of money in your account and still have upcoming bets, these bets will not be placed until you deposit money into your account. Please note that BingoBets wagers cannot be made using your Bonus balance (BBs). You can cancel bets for any bets that are pending. If a Bingo game is cancelled or the BingoBets draw cancelled, you will get a message telling you that the draw has been cancelled. Because the game hadnâ€™t started, no money gets withdrawn from your account. Bets are also cancelled for games where a winner is called within 5 or 6 calls. In this case, your bet gets placed for the next available draw. To see a report of any cancelled BingoBets draws, go to your BingoBets Orders Report in the My Account section. To cancel a bet, go to the Pending column on the Details tab. This is where youâ€™ll find any bets youâ€™ve made; bets for games that have not yet played or are not waiting to be played next. At the far right is the Games column. This column lists the number of games for which youâ€™ve made this bet. Beside the number is a button labeled with an X. Select the X to delete your bet. A confirmation window asks you whether or not you â€œwant to cancel this bet?â€�. Select Yes to cancel bets for these games. Select No if you want to keep these bets. 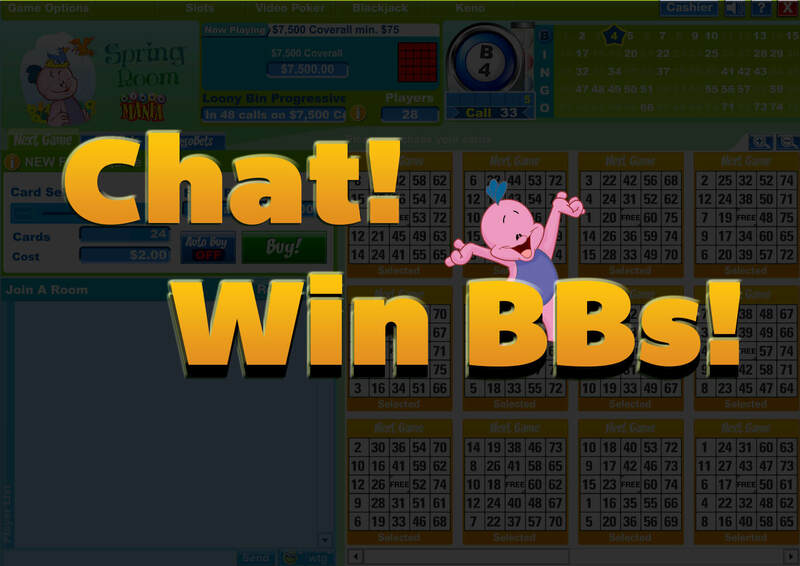 To play, click on the bingobets tab just above the chat window and click on the BET button. Youâ€™ll see a variety of games you can choose from, which are all listed below. Bingo Bets: Bingo War â€“ Will the last number of the BingoBets draw be higher or lower than the first? Example: if the final BingoBets draw numbers are 23, 47, 62, 58, 71, 14 then anyone who bet lower wins (14 is less than 23). Bingo Bets: Oddly Enough â€“ Will there be mostly odd or even numbers in the BingoBets draw? Example: if the final BingoBets draw is 23, 47, 63, 58, 71, 14 then anyone who bet odd wins (4 numbers are odd, 2 are even). In cases of a tie (3 odd, 3 even), no one wins. However, if the final BingoBets draw is 23, 18, 65, 40, 12, 61 then you donâ€™t win (there are 3 odd [18, 40, 12] and 3 even [23, 65, 61]). Bingo Bets â€“ Hot or Not Hot or Not â€“ Will the total of all 6 numbers in the BingoBets draw be Hot or Not? Example: if the final BingoBets draw is 23, 47, 62, 58, 71, 14 the total is Hot (23+47+62+58+71+14= 275). Bingo Bets â€“ In a BingoBets draw, the 6 numbers, when added, equal a specific total. Will the numbers in that total, when added together, equal your selected number? Example: a BingoBets draw of 5, 12, 15, 23, 45, and 50, when added, equals 150. The Tiny Total for that draw is 6 (1+5+0). Bingo Bets: Lucky Number â€“ Will your lucky number be called as part of the 6 numbers in the BingoBets draw? 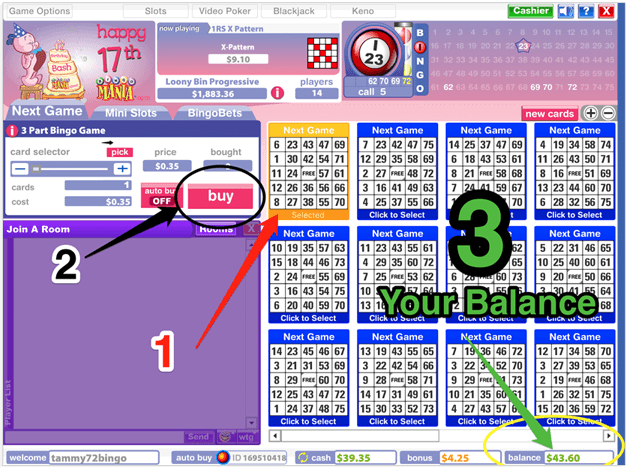 Example: if you choose 55 and the BingoBets draw is 17, 18, 29, 46, 55, 1 then you win (55 is your lucky number and is part of the BingoBets draw).